I’ve got a new Celtic design to share here that I’m pretty psyched about – a Celtic Owl! 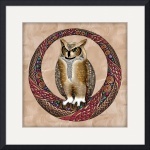 It’s a Great Horned Owl, with markings of Celtic knotwork on its chest and head, perched in a circle crescent wreath of Celtic knotwork ribbon, weaving, spirals, and dark, jewel-tone pebbles. Click here to browse Celtic Owl t-shirts, sweatshirts, keepsakes, mugs, phone cases, tote bags – all kinds of stuff. Celtic Owl Shower Curtain, Duvet Covers, Pillowcases and Throw Pillows – If you’re a major bird lover, you might also consider making over your bedroom or bathroom with a Celtic Owl Duvet Cover (Duvet Covers available in twin, queen, and king sizes) or a cool shower curtain! Celtic Owl Fine Art Prints – And finally, fine art prints of the Celtic Owl Art are available, with or without framing, or even as a canvas print, through my gallery at Imagekind. Thanks for checking out the newest addition! The eighth and final (for now) design in my “Lost Tokens of the Ancients” Celtic coin series is based on a coin of the Arverni Tribe, from the Auvergne area of France, first century BC. This spear and shield toting Warrior represents Chieftain King Vercingetorix who united tribes of Gauls in an ultimately unsuccessful revolt against Julius Caesar. Well, at least he tried! Fine Art Prints of the Celtic Chieftain King Vercingetorix Coin design are also available via our gallery at Imagekind, as well as the entire series. Click here to see the coin options like canvas prints, framed and matted, and more! The seventh, and next to last, design in the “Lost Tokens of the Ancients” Celtic coin series is based on a coin from Dacia, Thraco-Getae (Bulgaria/Romania area of the lower Danube), 2nd-1st Century BC. The stately figure is likely King Burebista, with eagle, who unified Celtic tribes in this area, but who also led plunder and conquest raids across central and SE europe until his assassination by someone from his own crew! The word next to his staff may be a version of the Greek word for King. Fine Art Prints of the Celtic King Burebista Coin design are also available via our gallery at Imagekind, as well as the entire series. Click here to see the King Burebista Coin Design options like canvas prints, framed and matted, and more! The sixth design in the “Lost Tokens of the Ancients” Celtic coin series is based on a coin of Celtic Gaul, of the Parisii tribe (in what is now Paris, France). It features a Winged Horse, the Celtic Horse Goddess, Epona (‘Great Mare’ in the Gaulish language) and originates in the 1st Century BC. This winged horse design is very stylized and artistically advanced – very cool! Fine Art Prints of the Celtic Horse Goddess Epona Coin design are also available via the Art of FoxVox Gallery at Imagekind, as well as the entire series. Click here to see the coin options like canvas prints, framed and matted, and other art options! The fifth design in my “Lost Tokens of the Ancients” Celtic coin series is based on a coin from the lower Danube (Hungary, Romania, Bulgaria) area. It features a woman with a victory wreath, driving a quadriga (a chariot with 4 horses running abreast). The inscription “L IVLI BVURSIO” is thought to be an imitation of theRoman moneyer L. Julius Bursio. The fanciful way the horses and all of their legs (crazy, crazy legs!) were drawn says a lot about the artist who minted this coin design two thousand years ago! Fine Art Prints of the Celtic Victory in Chariot design are also available via our gallery at Imagekind, as well as the entire series. Click here to see the coin options like canvas prints, framed and matted, and other art options for your wall. The fourth design in my “Lost Tokens of the Ancients” Celtic coin series is based on a coin from Italy! Or, the area that today we know as Italy. The Insubres were a Gaulish tribe in Insubria, in what is now Lombardy, Italy and were the founders of Milan. The design features a fierce lion image and is dated from about the 3rd Century BC. It’s a simple, but classic design to be impressed on a bit of currency so long ago. I thought the arching back of the lion, and the way they hammered out the main design were particularly cool. Also reminded me of the lions in the Roman Colosseum, naturally. Fine Art Prints of the Celtic Lion design are also available via our gallery at Imagekind, as well as the entire series. Click here to see the Celtic Lion Coin zoom image and options like canvas prints, framed and matted, and more! When I first saw this coin, I just loved the artistry in the design – so stylized! Never thought of the ancient Celts of being so funky! Fine Art Prints of the Celtic Wreath Rider design are also available in my gallery at Imagekind (as well as the entire series, in case you have a staircase or long hallway that needs decorating with a little ancient history!). Click here to see the coin options like canvas prints, framed and matted, and more!